The mother of Arsenal player Ainsley Maitland-Niles claims she is homeless and has been living in a metal storage container. Jules Niles says she has to sneak past staff at the Big Yellow Storage warehouse to sleep in the 10ft square metal box – despite her son earning £30,000 a week. 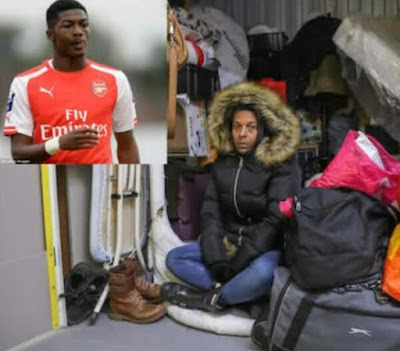 The 38-year-old has been living in the box for the past three months after her relationship with Ainsley, 20, broke down and he refused to be a guarantor so she could rent a flat. She said: ‘It’s a metal container with no windows or carpet. There is no toilet or washing facilities. ‘It’s not a home. I know what home feels like – to be able to shower, brush your teeth and sit in your room. ‘Most of all, I miss my family. It’s horrible. I just want to know what I’ve done wrong. ‘It is heartbreaking. The area is covered in snow and it’s not been above freezing for days. I heard a homeless man died here overnight on Thursday.’ Ainsley – rated at £15 million – lives in a £700,000 luxury apartment in Finchely, North London with his brother Cordi, 23 and a charity worker, while his mum sleeps on a bare matress in an industrial unit just off the M25 in Hertfordshire. The pair grew up in council houses and temporary accomodation in and around Ilford, East London with their mum saying she was sometimes so poor she went hungry. Ainsley signed for the club’s academy when he was six, and made his debut for The Gunners aged 17 in the Champions League against Galatasaray in 2014. The family initially lived in a three-bedroom home in Hertforshire but fled in the middle of the night after Jule had a bust-up with Arsenal club staff. Jule now spends her days sitting in coffee shops or the local library to stay warm and pays £2 to shower at a local swimming pool. She added: ‘I believe there are very dark forces operating within football.